Key stakeholders interested in advancing research and development for the bioeconomy in Minnesota met on June 8, 2017 to kick-off the Minnesota Bioeconomy Commercialization Consortium (MBCC), hosted by the Bioeconomy Coalition of Minnesota (BCM) and Natural Resources Research Institute (NRRI). The kick-off involved progressive rounds of conversation to discuss key aspects in forming a research strategy for the MBCC with an aim to develop a consortium that will drive toward deployment of renewable and bio-based chemicals and fuels. Enable value-added utilization of Minnesota agriculture, forestry, and organic waste resources. To provide a little context, the BCM initially formed in 2012 to focus on passing legislation to attract commercial-scale production of renewable chemicals, advanced biofuels, and biomass thermal energy. Through a collaborative effort, it succeeded in 2015, and the AGRI Minnesota Bioincentive was created, a nation-leading production incentive program for aiding in commercial-scale deployment of bio-based technologies. 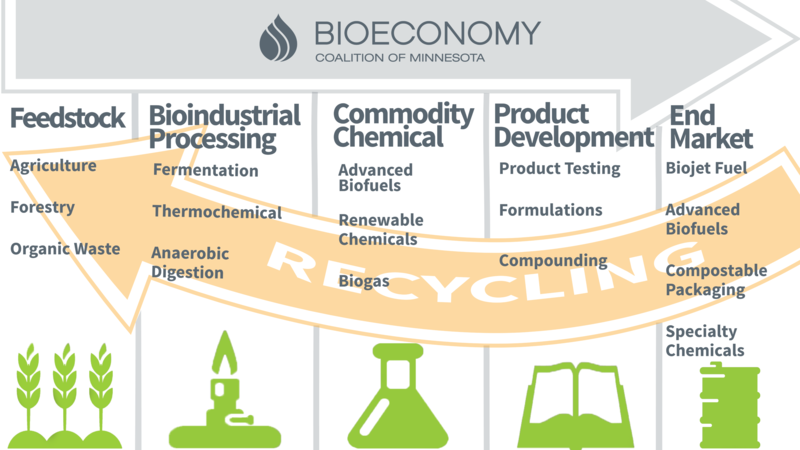 While the production incentive was a great first step in marketing Minnesota as a center for bioeconomy projects, it revealed a need for targeted research and development. One of the priorities for the BCM identified through strategic planning is to coordinate bioeconomy R&D in Minnesota, which led to partnering with NRRI to create the MBCC. Over the next few years, the MBCC plans to develop consortia to overcome critical barriers present in the bioeconomy, identify funding opportunities for those consortia, and help key projects move forward.